Infusion chair Cardiac | Chis s.r.o. 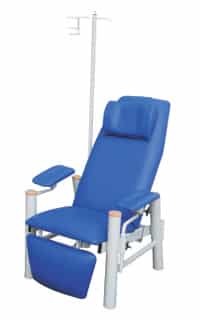 Infusion chair is designed for broad use in healthcare, particularly for administration by infusion and blood collection. Two gas springs allow independent strengthening of the back and leg part to anti-shock position, both the operating personnel and the patient. Shaped armrests are adjustable in all directions (3D). Integrated infusion stand facilitates cleaning around the chair and saves space. Infusion stand can be used on both sides of the chair.